Yangzhou H&r Plastic Dailychemicall Co., Ltd. Proprietary Name: Bobbarker Antibacterial Wrapped Body What is the Proprietary Name? Non-Proprietary Name: Benzethonium Chloride What is the Non-Proprietary Name? 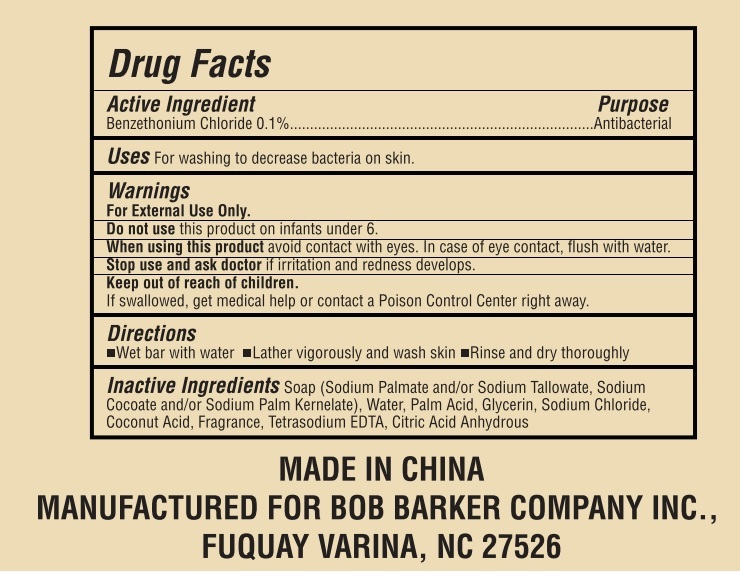 72797 - Yangzhou H&r Plastic Dailychemicall Co., Ltd.
Bobbarker Antibacterial Wrapped Body with NDC 72797-001 is a a human over the counter drug product labeled by Yangzhou H&r Plastic Dailychemicall Co., Ltd.. The generic name of Bobbarker Antibacterial Wrapped Body is benzethonium chloride. The product's dosage form is soap and is administered via topical form. Labeler Name: Yangzhou H&r Plastic Dailychemicall Co., Ltd.
Avoid contact with eyes. In case of eye contact, flush with water.Don't use this product on infants under 6 months of age. If irritation and redness develops. Wet bar with waterlather vigorously and wash skinrinse and dry thoroughly.